Direct deposit allows you to pay your employees automatically, saving time and headaches. Best of all, there's no additional charge for this service! Payroll by Wave is currently only available in North America. Set up the bank account you'll use to pay your employees. Enter your employees' banking information. In general, you should begin this process a few business days before you need to approve your first payroll. If you need to approve a payroll immediately, you can do that too! If you're waiting for your direct deposit application to be approved, you could write checks for your first payroll and use direct deposit once approved. If you’re in the process of setting up Payroll by Wave from scratch, click Get Started. You’ll be asked to fill out a few quick questions about your business needs so that setup can be customized for you. This will include your business location, whether or not you’ve run any prior payrolls this year, and if you want to pay your employees by direct deposit, or write checks by hand. 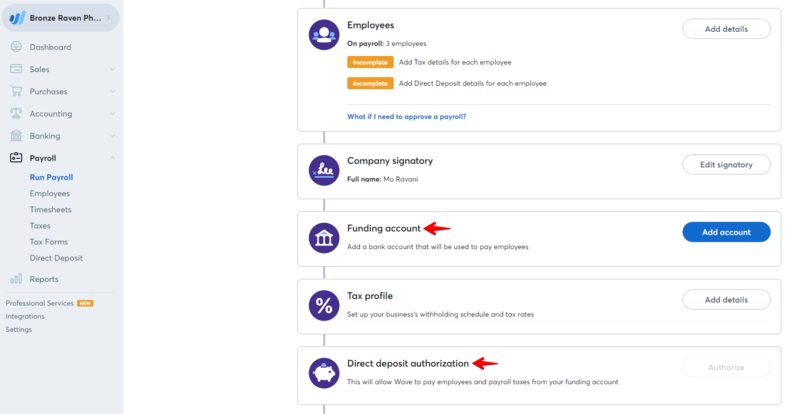 Check the box to indicate that you want to use direct deposit; you’ll see prompts to add the required information on the Payroll Setup Hub. 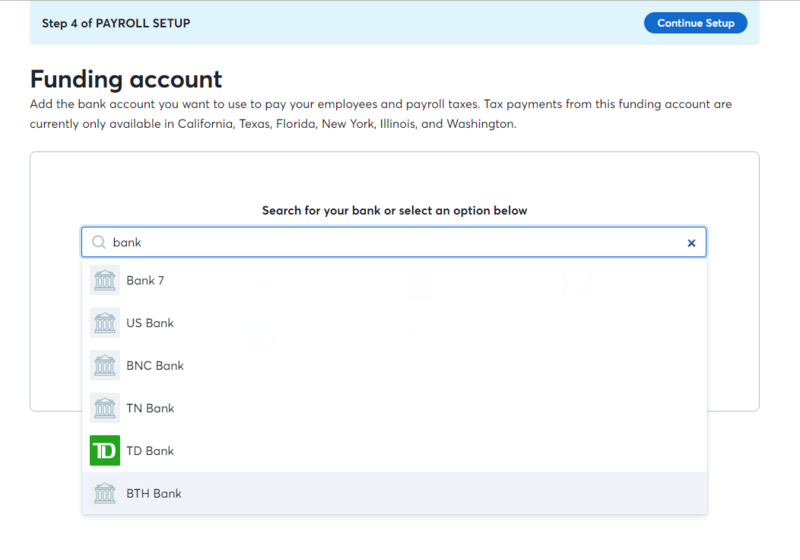 If you’ve already set up your Payroll by Wave account, but didn’t add direct deposit and want to do that for your next payroll, click on Run Payroll, then on Add Direct Deposit, which will take you to the Payroll Setup Hub so you can follow the steps below. Alternatively, you can add direct deposit from the payroll home page at any time by clicking on Payroll Setup, and then on Add New Feature at the top of the page. From here, there are two steps to complete your direct deposit application: enter your banking information, and complete a quick ID verification. 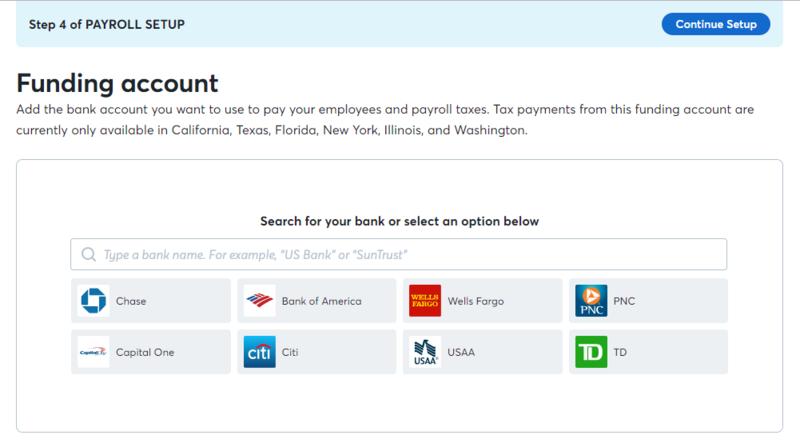 From the Payroll Setup Hub, click Funding Account (the account you want to pay your employees from). On the next page, choose your bank from the list of common financial institutions, or search for it in the search bar, and sign in using your normal online banking credentials. If you can't find your financial institution, you can connect your bank account by entering your routing and account numbers. Once you’ve entered your banking information, click Continue Setup. You’ll be taken back to the Payroll Setup Hub, where you enter the Direct Deposit Authorization. This is a simple identity verification – we want to make sure you’re you! Click Authorize to begin. You’ll be asked to scan a piece of photo ID, like your drivers license, or answer a series of questions only you would know the answer to. Try to answer the questions as quickly and accurately as possible without leaving the page. 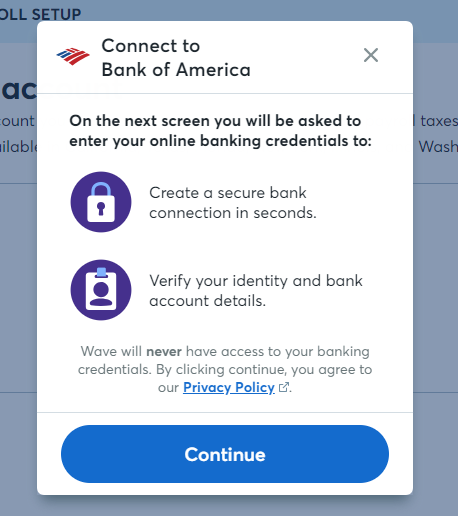 Before you submit your application for review, you'll need to agree to Wave's Terms of Service for Direct Deposit Services. Now your direct deposit application is under review! It can take up to 10 days but is usually much faster than that. You’ll hear from us at the email address you used to sign up for Wave once you’re good to go, or if we need any further information. While you’re waiting for your application to be approved, you can move on to setting up your employees for direct deposit. If you need to pay your employees today you can skip ahead to entering employee hours and issue checks for this first payroll while waiting for approval. Click on the Employees navigation and choose the employee you want to set up by clicking their name. Click Direct Deposit from the left menu. Enter the employee's banking information. Click Save to update the information entered. You can come back and edit this information any time. As mentioned previously, if you need to pay your employees today or before your application is approved, you can always run a payroll and write checks. In that case, all that’s left to do before you approve the payroll is to Enter Employee Hours. In general, you should begin this process 10 days before you need to approve your first payroll. If you need to approve a payroll immediately, you can do that too! If you're waiting for your direct deposit application to be approved, you could write cheques for your first payroll and use direct deposit once approved. You’ll be asked to fill out a few quick questions about your business needs so that setup can be customized for you. This will include your business location, whether or not you’ve run any prior payrolls this year, and if you want to pay your employees by direct deposit, or write cheques by hand. On the next page, choose your bank from the list of common financial institutions. If you don't see your bank, click Other Bank and search for your bank by name. You'll then be prompted to sign in using your normal online banking credentials. If you can't find your financial institution, you can connect your bank account by entering your transit, institution, and account numbers. Now your direct deposit application is under review! You’ll hear from us at the email address you used to sign up for Wave once you’re good to go, or if we need any further information. While you’re waiting for your application to be approved, you can move on to setting up your employees for direct deposit. If you need to pay your employees today you can skip ahead to entering employee hours and issue cheques for this first payroll while waiting for approval. As mentioned previously, if you need to pay your employees today or before your application is approved, you can always run a payroll and write cheques. In that case, all that’s left to do before you approve the payroll is to Enter Employee Hours.